After completing their assigned task of assisting search and rescue mission, Swiss and German teams have gone back to their counties. The report submitted by Swiss and German teams validated earlier indentified sites by Pakistan Army. 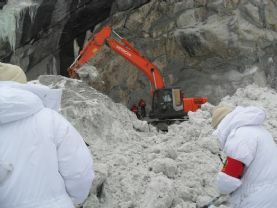 Meanwhile Norway and US Teams are at Gayari to assist the ongoing rescue operations. According to an Inter Services Public Relations (ISPR) press release, the search and rescue Operation at Gayari continues round the clock at its full pace. The rise in temperature has increased the chances of slides, however necessary safety precautions are being taken to ward off danger. The tunnel at site 1 has been widened slightly; however, the work on the tunnel is hampered due to presence of toxic gases in it. The work on other sites indentified by experts is in progress at full pace using all available resources.